The growth of co-working spaces has exploded in the past few years, and some credit unions are finding them a good mission fit. 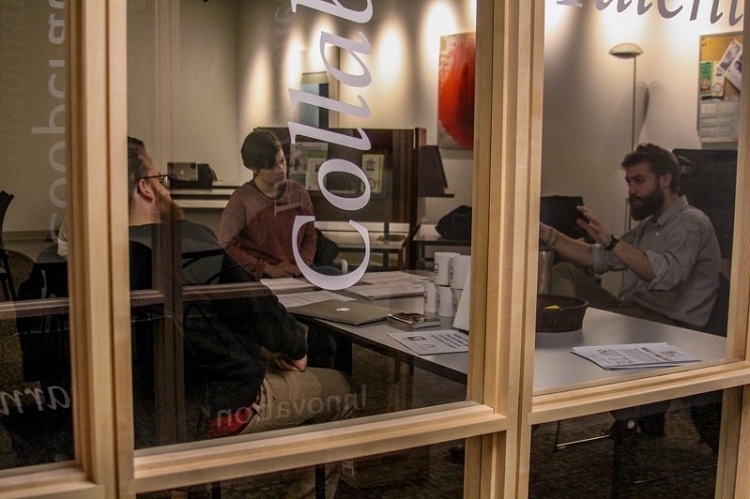 GCACU, DCU, and VSECU are using co-working spaces to increase market visibility, accelerate local innovation, and offer a home base for self-employed entrepreneurs, respectively. Co-working spaces are a fast-growing phenomenon that have emerged as the rise of the gig economy and other self-employed entrepreneurs has created the need for affordable locations for innovative spirits to commune and create. They’re also a natural fit for credit unions, a movement that began as tiny savings and loan pools that has grown into a network of full-blown financial services institutions hard-wired to collaborate on ideas and resources. A report by Emergent Research for the Global Coworking Unconference Conference predicts the number of U.S. co-workers to grow from 331,000 in 2015 to 754,000 this year to nearly 1.1 million in 2022. The same report pegs the number of co-working spaces at 14 in 2007, 5,026 this year, and a predicted 6,219 in 2022. Three credit unions are building their own shared space models that reflect each institution’s strategic approach to serving their field of membership while branding themselves as not only community lenders but also community leaders. 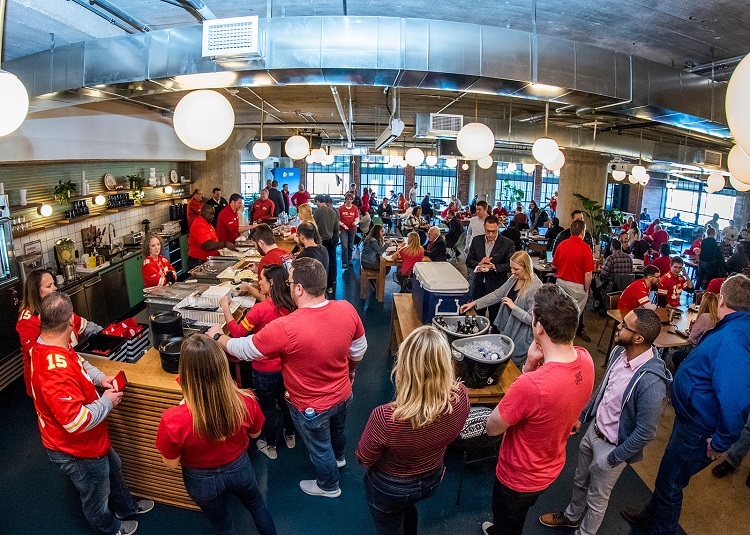 CommunityAmerica Credit Union ($2.7B, Lenexa, KS) has rented a chunk of the WeWork shared office building in a hip section of downtown Kansas City, MO, to use as work space for its own employees and for community lunch-and-learn and happy hour-style events. Digital Federal Credit Union ($8.5B, Marlborough, MA) has created the DCU FinTech Innovation Center, which it describes as a “non-profit, mission-focused fintech accelerator” in downtown Boston. Vermont State Employees Credit Union ($778.2M, Montpelier, VT) has filled extra space in a new branch in rural Bennington, VT, with local entrepreneurs and other tinkerers and thinkers who now occupy a shared space dubbed the Lightning Jar. CommunityAmerica currently has three departments sharing work space for approximately 10 people in the WeWork Kansas City building in the Crossroads Arts District across from a CACU facility that houses a branch and most of the credit union’s commercial team. Socializing is a big part of the collaboration that goes on in the shared space that CommunityAmerica rents in the WeWork building in Kansas City, MO. Chief innovation officer Anita Newton says CACU staff rotate through the WeWork space as needed, including members of the Innovation Lab in-house think tank. Along with individual seating space, there’s a meeting room and access to a large common space for hosting special events. Newton says such spaces also can help attract the kind of younger employees an innovative credit union needs to succeed going forward. Join Anita Newton and Callahan & Associates for a discussion about how CommunityAmerica Credit Union's innovation lab puts member experience first and what the cooperative has learned about developing tools that members will adopt. 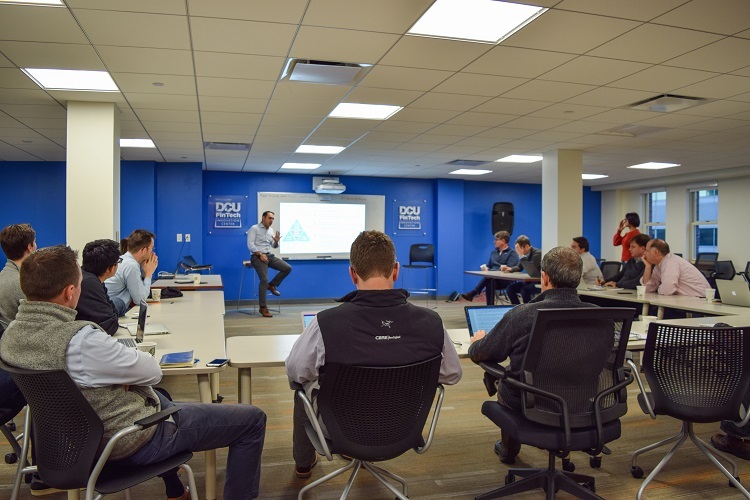 Members and graduates of the DCU FinTech Innovation Center in the Boston financial district have raised more than $200 million in capital since 2016 through various investment vehicles for their platforms, including some that already are in place at DCU itself. DCU launched the center in 2014 as free, sponsored co-working space. It became an accelerator two years later and now onboards eight to 10 new companies every six months for a year’s stay that’s worth more than $250,000 in benefits and the opportunity to explore fast-tracked pilots with the big credit union. “We provide access to customers, mentors, investors, and advisors for our startups, for zero fees or equity,” says Vasilios Roussos, who had an established record of startup creation and investing before becoming the center’s managing director two and a half years ago. The program focuses on supporting the future of its members, but according to Roussos, there’s plenty of credit union benefits, too. Presentations from thought leaders — McKinsey & Co., in this case — are part of the appeal for tech startup tenants of the DCU Innovation Center in Boston, MA. The center has 40 desks (including one for DCU president and CEO Jim Regan) and office amenities such as wi-fi and conferencing space that help the center build connection points between the credit union industry of today and the technology of tomorrow, Roussos says. Products from the FinTech Innovation Center that DCU has adopted include an artificial intelligence system for managing email (Roussos says it was developed by students of the MIT creator of Suri) and a machine learning-driven platform that automates onboarding. Entry into the accelerator is highly competitive, but so is the market in which DCU operates. Roussos says there are four co-working centers on his street and probably eight of them within six square blocks. 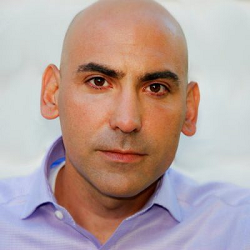 To differentiate a co-working space as the concept itself becomes more commoditized, Roussos advises operators to offer benefits that create demand beyond filled desks and meeting rooms. After merging with two small credit unions in a southwestern corner of Vermont, VSECU found itself with a new branch and some extra space. The credit union needed a location in Bennington, approximately 120 miles south of VSECU headquarters in Montpelier, to serve members who had belonged to credit unions housed in their SEG sponsors and to stake a claim as a community financial institution new to the area and ready to do its part to revive the area’s struggling economy, says CEO Rob Miller. “We found a building we liked but we didn’t need all of it,” Miller says. With economic development in mind, the city and credit union shared the expenses of converting the extra space into the Lightning Jar, a co-working space that opened four years ago and is now occupied by 15 paying members engaged in a variety of endeavors. Sharing ideas as well as space is the idea behind the Lightning Jar, a co-working spot inside the Bennington, VT, branch of Vermont State Employees Credit Union. The Lightning Jar is named for the brainchild of a local inventor who patented a design for canning jar lids by that name. Today, it’s a way for the credit union to help entrepreneurs in the same small town 160 years later. “It has an interesting vibe,” Miller says. Occupants enter the space through the branch’s front door during business hours and through an alternative access in off hours. The branch and the Lightning Jar share kitchen space and restrooms, and just like in the big co-working spaces, the facility includes meeting rooms, video presentation equipment, internet, printing, and access to hosted educational and social events. Miller, who served as commissioner of economic development under former Gov. 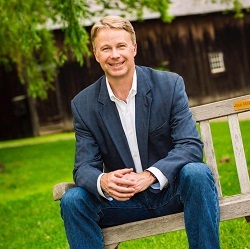 Howard Dean, also is leading VSECU’s participation in crowdfunding for startups and in a co-working facility that’s part of a larger re-development site in Burlington, the state’s largest city. That one will even include housing as part of its services for entrepreneurs in need of a place to incubate. 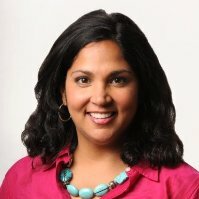 Experience with the We Work space CommunityAmerica is using in downtown Kansas City, MO, has informed these best practices from Anita Newton, the credit union’s chief innovation officer. Be clear on your management objectives: are you trying to grow your small business base? Build relationships in the community? Build innovation thinking? Work methodically and diligently to add value to the community. This is different than ‘selling’. At CommunityAmerica we’ve worked hard to build programs that show we truly understand the co-working community. Events have included tax planning and college and career planning workshops and a Chiefs tailgate to celebrate the NFL playoffs. Spend some time on a thoughtful design. Your office serves as a billboard for others. Think carefully about the type of image you want to project.